Home › Blog › Mas Camp at C.A.F.E.! How has a grassroots artform inspired Europe’s largest street festival, Notting Hill Carnival? Why not join Sunshine International Art’s Mas Camp? 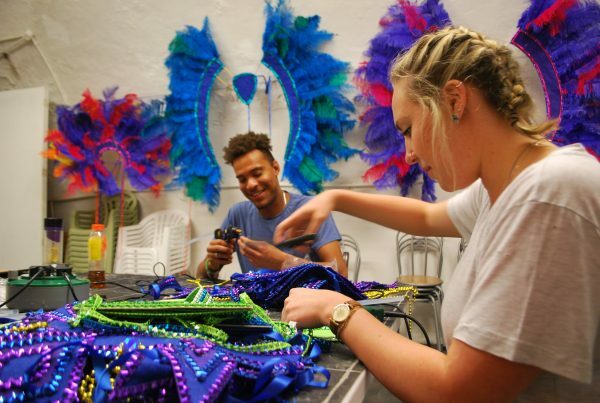 Mas Camp at Sunshine International Arts’ ‘C.A.F.E.’ (Carnival Arts for Everyone) is a melting pot of creative flair in a multitude of artistic crafts: feather flowing; wire bending; headdress building; and costume decoration. Under the guise and enthusiasm of Trinidadian designer Ray Mahabir, you will gain a variety of skills in carnival arts and learn the truest form and history of traditional carnival Mas Bands. In a highly differing communal setting, Mas Camp offers a brilliant schedule of carnival arts that will not only be heart warming and enjoyable, but also artistically challenging. So come join in with Mas Camp at C.A.F.E. and experience the exuberance of carnival arts! The term ‘Mas CAmp’ originates from Trinidad and Tobago. All carnival Mas Bands (Mas – masquerades and Band – a group of people) have headquarters known as Mas Camps. Mas Camps are centres of production for carnival costumes, a place where you meet other carnival-friendly people, learn about costume building, and listen to the latest carnival music – ‘Soca’. Contact admin@sunshineiarts.co.uk to register your interest in getting involved with this year’s Notting Hill Carnival.